Rosane Brambilla Reis was a 37-year-old mother of two when a trip to the doctor’s office turned her life upside down. She walked in with an apparent cyst in her breast. She left a cancer patient facing surgery, radiation and chemotherapy – not to mention long odds. “I was an immigrant with a good job and then, all of a sudden, ‘boom,’” recalls the Brazil-born Brambilla Reis, now 61. While Brambilla Reis was eventually declared cancer free, she remains physically, if not emotionally, scarred by the experience. She considered having reconstructive surgery, but ultimately decided she’d had enough invasive treatments to last a lifetime. But what if cancer survivors were spared such difficult decisions in the first place? Soror Sharifpoor believes she has the answer. Through her startup Polumiros, the University of Toronto researcher is developing a unique polymer surgeons can use to fill the void in breast tissue immediately following a lumpectomy procedure. The polymer, called ReFilx (short for regenerative filler matrix), acts as a temporary scaffold to support new tissue growth before dissolving harmlessly away into the body. 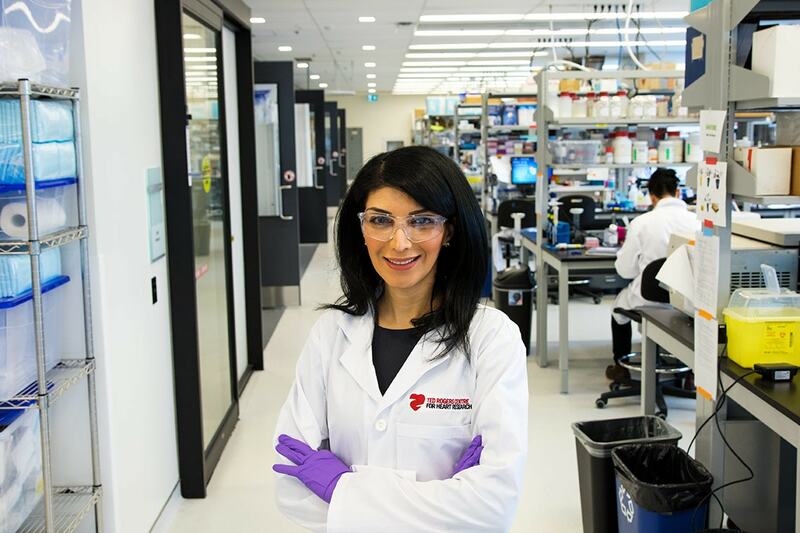 “The patients don’t have to go under the knife a second time,” says Sharifpoor, who completed her PhD at U of T in biomaterials and biomedical engineering and is now the research program manager at the Ted Rogers Centre for Heart Research's translational biology and engineering program. Such a procedure would not only improve the mental and emotional well-being of breast cancer patients, argues Sharifpoor, it could also encourage surgeons to take more aggressive margins around a tumour, thereby reducing the chances of cancer recurrence. “That’s something we haven’t proven in humans yet, but is something we anticipate will be an outcome,” she says. Sharifpoor’s startup, co-founded with Kyle Battiston, a post-doctoral researcher in U of T’s Faculty of Dentistry, is just one example of how laboratory innovations at U of T, one of the world’s top research universities, are being spun into startups that could have big impact in Canada and beyond. That includes everything from using artificial intelligence to search for disease cures to devising new technologies and materials to fight climate change. U of T, which kicks off an annual week of entrepreneurship events on Monday, is home to nine different entrepreneurship hubs that cater to a variety of entrepreneurial needs and levels of development. It’s also at the centre of a rapidly growing innovation network in Toronto – comprised of hospitals, research institutes and a proliferating array of incubators and accelerators – that’s attracting some of the world’s biggest companies, from Alphabet’s Sidewalk Labs (a Google company) to car-sharing giant Uber. As for Sharifpoor, she did her PhD in vascular tissue engineering – “We have a lot of heart problems in my family – especially on my father’s side” – and spent a lot of time working on polymers in the lab of U of T Professor Paul Santerre, an entrepreneurially minded researcher who has appointments in the Faculty of Dentistry and the Institute of Biomaterials & Biomedical Engineering. Then, one day, a surgical oncologist approached Santerre’s lab in search of a reconstructive material to be used on his lumpectomy patients, who were being given few options. As luck would have it, Sharifpoor and Battiston had a polymer originally developed for a cardiac application that potentially fit the bill – albeit with a few key tweaks. “We started adjusting the chemistry and made the polymer softer so you won’t feel it once it’s implanted,” says Sharifpoor. “We also made it degradable so that it slowly dissolves over time, allowing the cells and tissues to infiltrate. Yet, despite the promise ReFilx holds for millions of breast cancer patients, Polumiros’s path to market remains equal parts long and risky. Founded two years ago, Polumiros is just now wrapping up its third round of pre-clinical trials on ReFilx. By this summer, the plan is to repeat the trials with a certified research organization so Polumiros can get the necessary regulatory approvals to conduct clinical trials. Sharifpoor is currently targeting a date of 2023 or 2024 for commercialization – assuming, of course, she and Battiston can raise the necessary $25 million from investors. Contrast that to the experience of other startups who can build a nifty smartphone app to share photos or hail a taxicab in a few months with a seed investment of a few thousand dollars. “When we do pitches at competitions and we’re competing with other entrepreneurs developing apps, we’re so far away when it comes to our timelines and the seed funding we need” says Sharifpoor. Santerre, for his part, says Sharifpoor “has entrepreneurship blood in her” and credits her for getting the idea off the ground before leaving his research group. “She has a 'let's get it done, and let's do it right' attitude to tasks, which is a great attribute in the startup world,” Santerre says. Fortunately, startups like Polumiros also have an expansive support network at U of T – and Toronto more broadly – to help them navigate the myriad hurdles associated with building a successful health-care business. Sharifpoor says she’s received support from three U of T accelerators – the Impact Centre, UTEST and the Health Innovation Hub (H2i), where Santerre is a co-director. They’ve also received assistance from MaRS Venture Services and the Ontario Bioscience Innovation Organization. And, while it’s not officially a member, Battiston says Polumiros has participated in investor events organized by JLABS @ Toronto, the first international location of the life sciences incubator created by U.S. health giant Johnson & Johnson. “The support has been invaluable to myself and Kyle,” Sharifpoor says. Sharifpoor is now trying to return the favour. At the Ted Rogers Centre, she is hoping to start an entrepreneurship program with the help of H2i to encourage more commercialization of cardiovascular research, an area where she says there are currently too few startups in Canada. Such commitment is welcome news to cancer survivors like Brambilla Reis, who routinely tells people she’s 25 years old because that’s how long it’s been since she was declared cancer free. If the option had been available, she says she would have jumped at the chance to have undergone a surgery with a better cosmetic outcome.